SPECIAL = Get a FREE Youth Gear Bag / Free Youth MX Goggles / Free Lancer Youth MX Gloves! An $89-value, All 3 FREE with purchase of this ATV! This is an Xlint quality cart that offers all the popular features found on much more expensive karts. 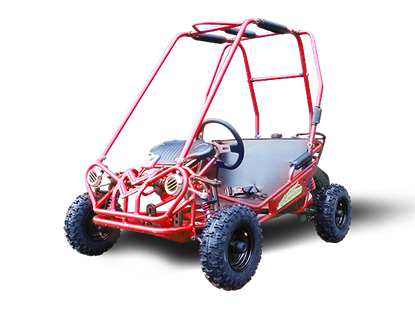 TrailMaster Go Karts have been sold throughout the world in Europe, the Middle East, and South America and now the USA for the last 16 years. TrailMaster has a long history of manufacturing go-karts, ATVs, dirt bikes, scooters, and motorcycles. Motobuys is proud to announce our new FULLY ASSEMBLED - READY TO RIDE OPTION! Let the pro's assemble your new Go Kart, it will arrive to your door built right, run tested and ready to ride. The only thing you do is 1. Hook up the battery, 2. Put gas in it and go riding! 1. Take the unit out of the crate. 5. Install the steering wheel. 6. Hook-up the the Battery. 7. Check and tighten all your bolts. 8. Put gas in your unit. Start your unit! Note: The actual assembly may vary on different models, and it is always best to have a Mechanic assemble your unit. If you need parts at the bottom of our home page you will find �Parts Request�� or http://www.motobuys.com/part-request-form.html = simply fill out the form and click submit. Mx Series-8 Off-Road Elbow & Knee Guard Combo Kit from Motobuys.com - Great Gift Idea!